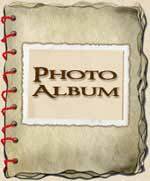 MBIS MBISS Rarities IABCA Ch. Tyler was the dream we had in mind when we bred Ivan and Josi. An extreme white with a smattering of gold spots, coupled with the loveliest head and expression, and a cute personality to boot (hence his name). When his mother was in whelp, the pup in front of him turned around and became stuck in the birth canal. A c-section was needed for the last two pups. Unfortunately, his brother was lost - but imagine my surprise when they brought me this little bundle of joy from the surgery room! Tyler has grown into a magnificent young male. While being one of the smallest breeding quality males in the U.S., he still retains a masculine appearance, and possesses excellent quality - sound free-flowing movement (with no hackneyed high stepping), an exquisite outline and lots of breed type. 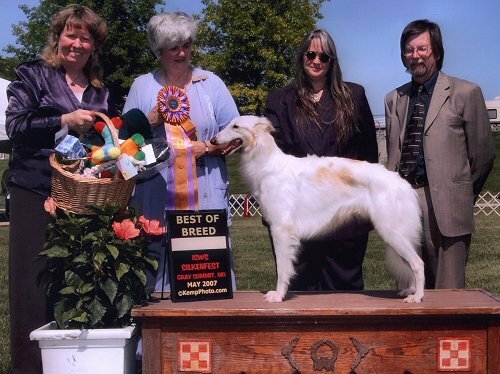 Tyler was Winners Dog/Best of Winners (from the Bred-By Exhibitor class) at the 2004 Silkenfest Specialty, held in Austin, TX, with Sandra Moore of Avalon Borzoi judging. At the summer 2004 Rarities dog shows in Denver, CO, Tyler not only finished his Rarities championship, but also earned a Best in Show. Tyler has also met the requirements for the ISWS Championship which requires a win at an ISWS-sanctioned specialty show. 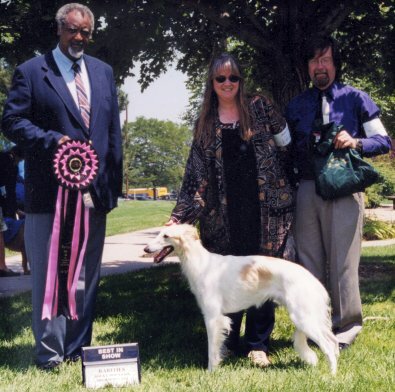 In October 2004, we travelled to Woodstown, NJ for a series of Rarities Shows as well as a Silken Windhound Specialty held in conjunction with those shows. Tyler came away with top honors, taking Best in Specialty Show, with his sister Ginger going Best of Opposite. Tyler also won Best of Breed at the other 3 shows. In January 2005 Silkens were accepted to show at the IABCA International Shows. We "celebrated" by taking a group down to show near Austin, Texas. At their show featuring Rare Breeds, Tyler came away with Best Rare Breed in Show, as well as earning his IABCA (UCICB) championship! In March 2005, Tyler became a father. We bred him to Sola, with the result being our D-Litter. From that litter we have chosen the irresistible Trouble (BIS Gryffyn's Gypsy Road) to remain with us. She possessed that certain "sparkle" that her father has - one's eye would just be drawn to her. 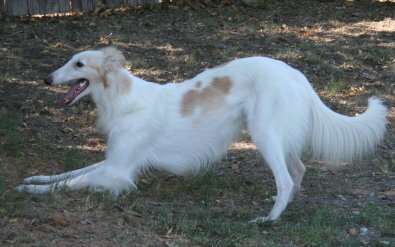 Tyler won his second ISWS Specialty Show by taking Best in Specialty Show at Silkenfest 2006 (ISWS' national specialty show) under judge Anita Squires (of Falconcrest Borzoi)! 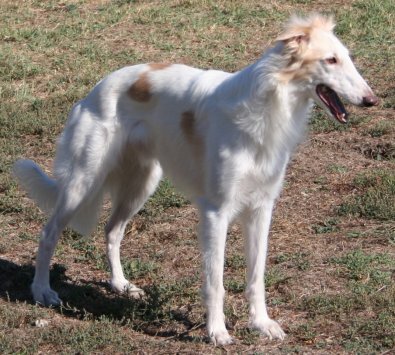 He then made it a "two-fer" by winning BISS at Silkenfest 2007 as well (judge: Gwen Post, Mutzko Borzoi)! Tyler won Silkenfest for the third time in 2009, earning his ISWS Grand Championship. Tyler definitely stands out in the Silken crowd, and we look forward to seeing what else is in store for his future! 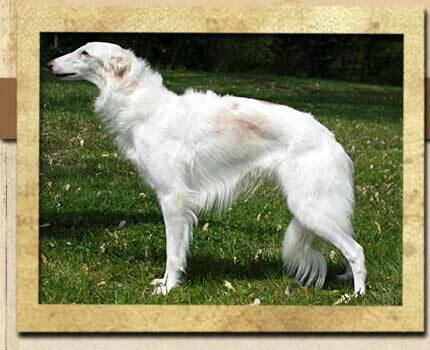 In 2007 Tyler sired a litter for Talisman Hounds, from which his son Goth has come to the Aeyrie. In 2010 Tyler was bred to Myla (Kristull Milagra) in a co-breeding between Ricmar and Gryffyn's Aeyrie. We chose a lovely daughter, Jules, to join us here. Tyler is a three-time winner of the ISWS National Specialty, known as SilkenFest. He was also awarded Winners Dog at the 2004 SF, and in his later years, multiple Awards of Merit.